Are these money worries keeping you up at night? Are money worries keeping you up at night? You’re not alone. A GOBankingRates survey found that a quarter of Americans are worried about their finances this year. In the survey, we asked 1,000 Americans a series of questions to get a sense of what financial worries they have — and the goals they want to achieve in 2019. The results show that despite a booming economy and low unemployment rates, plenty of Americans are still concerned about their finances. About one in four people polled responded that they’re worried about their finances in the coming year. And even that belies people’s worries as the 13-17 age group — many of whom are probably still living at home and attending high school — only had about one in 10 say they were worried about money. For people aged 35-44 and 55-64, one in three people revealed concerns about the state of their financial lives. Women, meanwhile, are definitely more concerned about the issue than men. Some 29 percent of women answered that they’re concerned about their finances compared to just 22 percent for men. 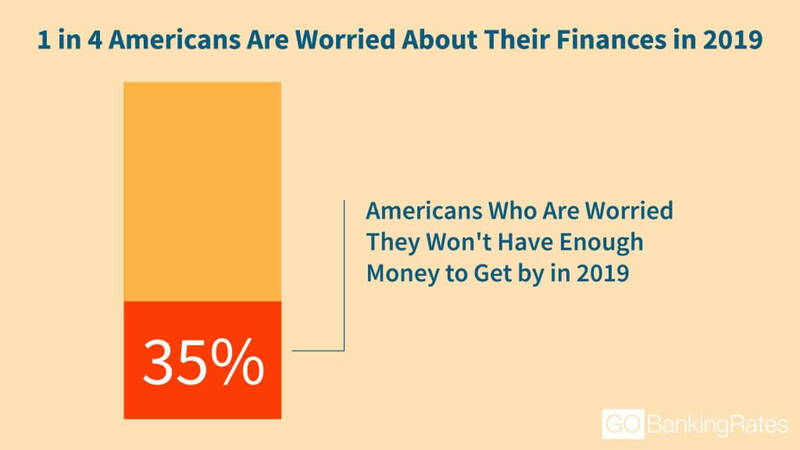 Which Americans Are the Most Worried About Their Finances in 2019? For those Americans who are worried about their finances, worrying about having enough money to get by is the most common response from those polled — overall and in each individual age group save for 55-64, where rising healthcare costs edged it out by a single percentage point. Worrying about not having enough to get by was most common for those in the 25-34 age group at 40 percent, but at least about one in three people or more cited the issue as a concern in each of the other groups. Survey respondents could select all that apply. Rising healthcare costs were also a major concern. The 55-64 age group had that as its most common response, but they were actually the second-highest response rate for that answer with the 45-54 age group coming back with 37 percent of respondents saying they were worried about the cost of healthcare. Worries about debt and healthcare costs were indirectly related, as young adults were more concerned with debt, giving way to worries about healthcare being more prominent among older adults. About one in three Americans aged 25-34 cited going into debt as a concern, but that rate decreased in each older group. Healthcare cost worries increased, though, with each age group up to the 45-54 group, then decreased only slightly for 55-64 before dropping to 24 percent for those 65 and over — probably a function of the availability of Medicare to senior citizens. Focusing on gender, women were markedly more concerned about finding a way to make ends meet, with worries about finding money to get by being cited by 41 percent of respondents compared to a rate of just 29 percent among men. The only other category with such a notable gap was concerns about rising healthcare costs, where 25 percent of women are worried compared to just 19 percent of men. As for what Americans are planning on changing in regard to their finances in 2019, the most common response was both simple and direct: save more money. Over one in three respondents said saving more money was their financial resolution for the new year. Saving more money was definitely a much more common answer for younger people, as about half of respondents under the age of 34 included that as their planned resolution. Paying down debt, meanwhile, is not a major concern the 13-17 age group — as one might hope — but it jumps to 20 percent for the 18-24 age group and is about 30 percent for each older bracket save for those aged 65 or over. 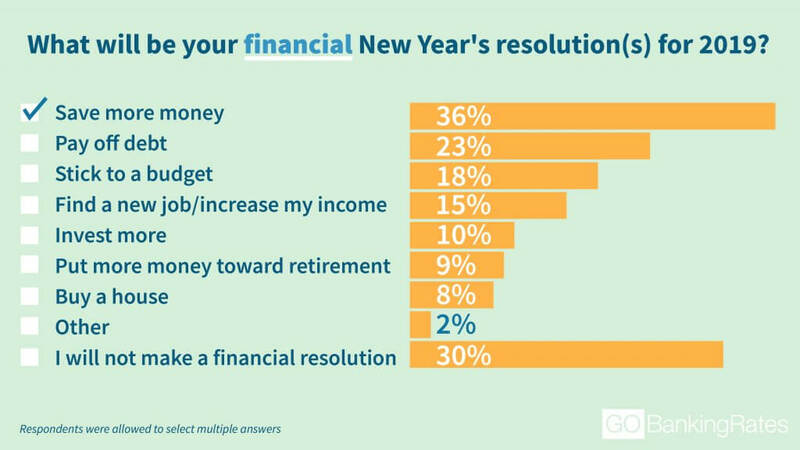 Figures represent percentage of respondents who chose each answer option for the question, “What will be your financial New Year’s resolution(s) for 2019?” Survey respondents could select all that apply. For women, though, saving more money is a much higher priority as a New Year’s resolution than it is for men. Some 44 percent of women said that was their planned resolution compared to just 28 percent of men. Much of that gap, though, appears to be made up of men who don’t see a need to make a resolution: 37 percent of men said they wouldn’t be making a financial resolution for the new year compared to just 24 percent of women. But how much are people planning to save for the new year? The average savings goal in the survey was just over $26,000 — an impressive figure given that the national median salary is just $55,322. Much of that is driven by a number from younger Americans that is most likely wildly optimistic. The average savings goal of those aged 13-17 — a group where one would expect full-time work to be relatively rare — was a whopping $39,221. That figure doesn’t fall far for young adults, though. 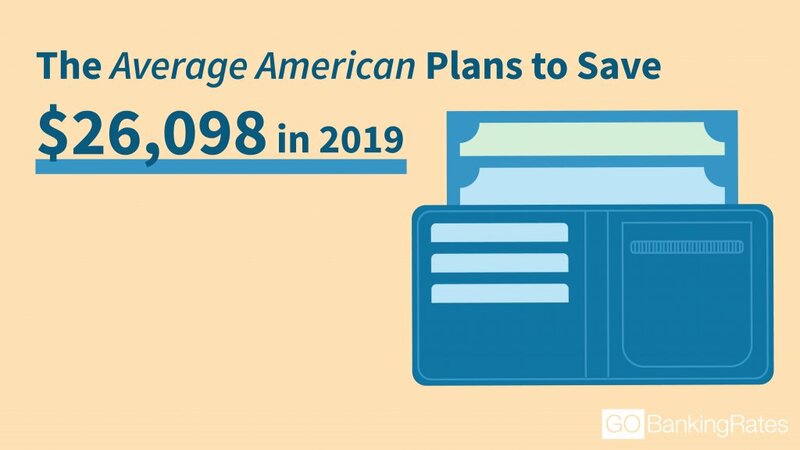 Each age group through age 44 gave an average savings goal of at least $30,000 for 2019, dropping to just over $25,000 for ages 45-54 before falling below $10,000 for those 55 and older. At the end of the day, though, those figures are probably unrealistic. For starters, based on the 50-30-20 budget rule that allocates 20 percent of your income to savings, you would need to be making $130,000 a year after taxes to hit a savings goal of $26,000 in 2019. What’s more, previous GOBankingRates surveys have found that — regardless of what people are hoping to accomplish — the reality when it comes to saving money isn’t nearly as good. For example, the 2018 retirement survey found that some 42 percent of Americans have less than $10,000 saved for retirement. So how does putting away more of your income rate as a New Year’s resolution? Highly. The GOBankingRates survey also asked respondents to name their lifestyle New Year’s resolutions, such as traveling, finding love and exploring a new hobby. More than one-third of respondents said they are resolving to get in shape, and about one-quarter said they plan to spend more time with family and friends. 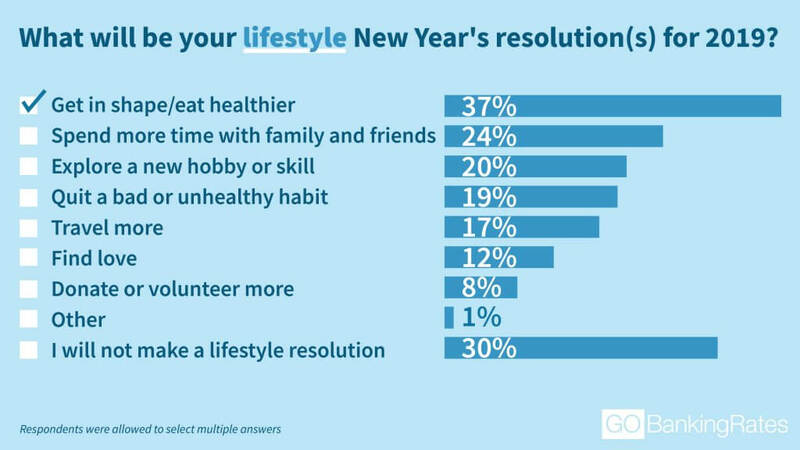 But when comparing the percentage of people who chose financial resolutions versus lifestyle resolutions, the survey found some financial goals outweighed the lifestyle goals. For example, a higher percentage of respondents said they wanted to save more money than said that they wanted to learn a new skill or hobby, quit a bad or unhealthy habit or even find love. Survey respondents could select more than one answer choice. Getting in shape/eating healthier was the only resolution with a higher response rate than saving more money, and it just edged it out at 37 percent of responses to 36 percent. The fact that so many people have major concerns about their financial picture might come as a relief to many who were worried that they were alone, however, the other good news is that some simple strategies can make saving more money an easy resolution to meet. There’s also an abundance of solid budgeting apps you can access that make tracking your spending and expenses simple. Apps like Chime or Qapital can set up regular, automatic transfers to savings and don’t require any action on your part. You can even use investing apps like Stash or Acorns to turn those recurring automatic donations into investments in stocks or bonds. Meanwhile, a separate GOBankingRates survey found that a quarter of Americans are confident they’ll be rich one day, but many of them aren’t taking the necessary steps to get there. How Do Your Finances Measure Up to the Typical American’s? Methodology: This survey was commissioned by GOBankingRates and conducted by Survata. Survata interviewed 1,002 online respondents between Nov. 16, 2018, and Nov. 19, 2018. Respondents were asked the following questions: 1) What will be your financial New Year’s resolution(s) for 2019? Select all that apply. 2) What will be your lifestyle New Year’s resolution(s) for 2019? Select all that apply. 3) For this upcoming New Year, is it more important for you to stick to your financial goals or your lifestyle goals? 4) What is your overall target savings goal for 2019? 5) Are you worried about your personal finances in 2019? 6) Which of the following worries you when it comes to your finances in 2019? Select all that apply. Get these St. Patrick's Day deals for less on March 17.